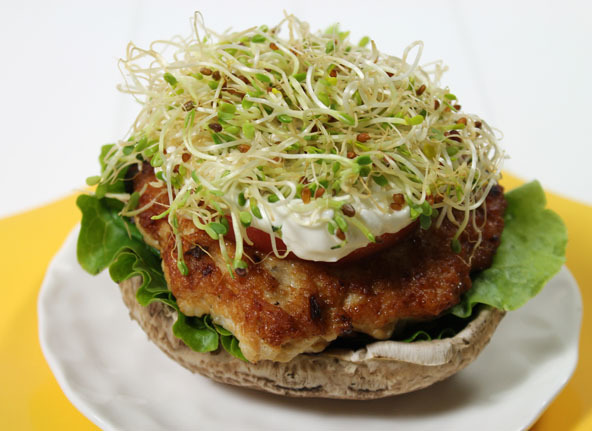 Seriously these chicken burgers are so full of scrumptiously delicious flavor! We love ’em here at our house. My local Sprouts store has chicken breasts on sale for $1.99/lb quite often. I just ask the meat clerk to grind the chicken for me and he does this at no extra cost. I always double this recipe because they re-heat up really well for the next days meal or they freeze great for an even later date. 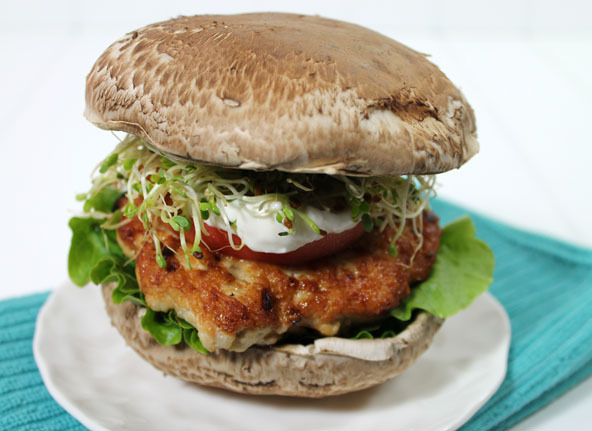 We love these chicken burgers with “Ramen Burger Buns” but usually just eat them with lettuce as the buns because lettuce is always available in the fridge and we really don’t need anything else. However I really do love a portobello mushroom as a bottom bun when I plan ahead. The taste adds to the burger and I like the extra shot of vitamin D mushrooms provide. Using a large spoon, In a large mixing bowl, mix all ingredients together for the Chicken Patty. Place coconut oil on the skillet and heat to medium high heat. This chicken mixture is quite soft and will stick to your hands if you try to shape it into patties so just place a spoonful on the greased skillet. Let it cook on one side for a few minutes and then flip it over and press it down into a patty with the turning spatula. Cook on both sides until it is done in the middle. Can eat them as is or serve on buns of choice such as mushrooms or lettuce or Ramen Buns. I can’t imagine actually using two mushroom buns. That’s way too much mushroom! Who besides Carly Simon and Mick Jagger has that big of a mouth anyway?